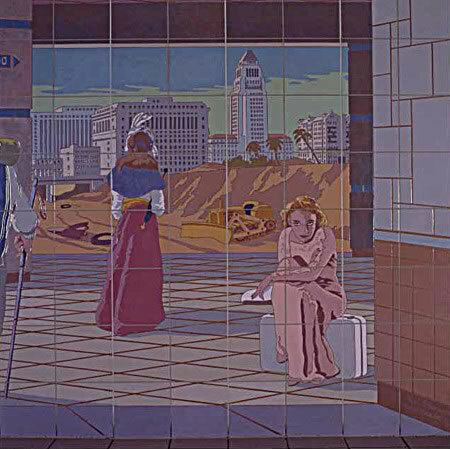 Traveler, a tile mural located at the bottom of the escalator at the east entrance of the subway station, depicts travelers from different eras in a Los Angeles “timescape” that features historical references such as Spanish galleons, the Pico House, Olvera Street and actress Carol Lombard. Terry Schoonhoven's use of perspective extends the station into the mural and enhances the viewer's momentary time travel fantasy as they pause on their own journey. "I had been interested in doing a mural about time travel since I arrived in Los Angeles—probably because it seemed so difficult to perceive the history of the City. For me the mural is a time machine, the only kind I know how to build." TERRY SCHOONHOVEN was born in Illinois. He received a Bachelor of Science from the University of Wisconsin and attended graduate school in art at the University of California, Los Angeles. In 1969, he co-founded the Los Angeles Fine Arts Squad. In much of his work, Schoonhoven used a trompe l’oeil technique to incorporate his paintings into architecture. He received grants from the National Endowment for the Arts and the California Arts Council. He created the mural “City Above” commissioned by Home Savings Bank for the Figueroa Street entrance to 7th Street/Metro Center Station, as well as a mural at the Cal State LA Metrolink Station. Schoonhoven was a prolific painter of large scale public murals until his death in 2001.